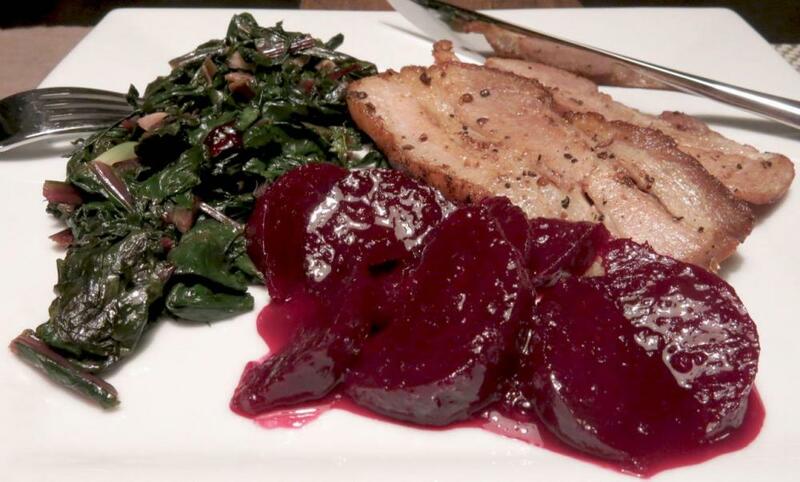 Great combination of flavors here with the cumin-cardamon-mustard seasoning on the pork, garlicky, slightly bitter and astringent greens and sweet/sour orange-glazed beet roots. At first bite, I thought the beet roots were awfully sweet but they grew on me over the course of the meal. Still, when I make it again (and I will) I'll probably use 1/3 to 1/2 of the amount of honey specified, depending on the sweetness of the oranges. Today, I used some very sweet cara cara oranges.